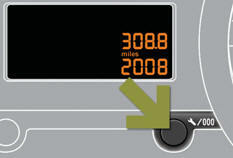 System which measures the total distance travelled by the vehicle during its life. The total and trip distances are displayed for thirty seconds when the ignition is switched off, when the driver's door is opened and when the vehicle is locked or unlocked. To conform to legislation in the country you are crossing, change the units of distance (miles or km) via the configuration menu.